Shelter is one of the basic necessities to human beings. In the past Derg Regime, any citizen aged 18 years and above can acquire 500m2 plot of land with the least service fee of 50-100 Birr provided he/she is capable to construct; however evidences testify that those incapable are loaned from 7-14 thousand Birr for the apartment construction with 20 Years repayment schedule. Currently, the citizens are being deprived of land ownership due to the policy that stated “Land belongs to the public & the government” following the proclamation “Land belongs to the government.” To the contrary, it seems that only members of the ruling party are beneficiaries of this system and other citizen are being dislocated from their habitat. Comparatively, the outstanding members of the ruling party are grabbing many houses and urban lands. In 2005, the low cost condominium houses construction begun for low income citizens following the new government project. At that time, more than 470 thousand residents were registered in Addis Ababa only but the information disclosed by the city administration shows that only 72 thousand houses were allocated in the last 7 years. This means that the government handed over houses only to 15% of the registrants in the past 7 years. The remaining registrants remain uncertain for when they will be getting their houses. The city mayor disclosed officially that there is no more registration for condominium houses at this right time. Due to the drawbacks in fulfilling housing needs by Condominium construction, the new housing plan was currently put forward. This new housing plan, called the 40/60, requires saving of 40% of the housing cost for five consecutive years. The remaining 60% shall be paid within 17 years after handing over of the house completing the 40% payment. It is disclosed that the project commences in 2012/13 but details are not known yet. As per the general quotation from the city administration, the one bed room house candidate is expected to save 857 birr monthly that total cost is 128,590 birr. The two bedroom house candidate is expected to save Birr 1,337 monthly that costs total birr 200,475. A candidate to three bedroom house is expected to save birr 2,133 monthly that total cost is 320,000 birr. The city administration disclosed that these houses are intended for the low income groups without clue to the average low income of citizens. I went to the Central Statistics Agency (CSA) to look for the average income of citizens (as low, medium and high) via the ministry of Finance & Economic Development; the office informed me that even if they have data for the last five years, they cannot allow such data before permission from the ministry and approval of the foreign donors. That may be due to the myth, as one official told me in secret, that these offices are accountable to the donors and not to the public at large. I have calculated education level and average salary of government employees and put the fact forward. The average salary of the lowest scale (guards & Laborers) and one year academic trainees is 800 birr, the master’s levels get 2500 birr and doctorate degrees get 3500 birr respectively. The above employees have such monthly deductions as income tax, pension funds, contribution for Abay Dam, EPRDF membership contribution which totals ranges from 15-20%. Economists’ device that employees free from any addiction could save up to ¼ of his/her salary. The saving for emergencies and long term investments including house rent fees. As mentioned above, the highly paid doctorate degree graduate shall save only to the maximum of 700 birr; as testified by an economist in Addis Ababa University. Accordingly, a highly paid doctorate degree employee is expected to save birr 857 to get the least one bedroom house but unfortunate to save such amount monthly. However, I would like to notify that the above calculations did not include the farmers and business people. Generally, some residents in Addis Ababa City mention that they doubt the 40/60 housing plan fits the citizens’ capacities. Therefore, it is not clear up to now that, which the target beneficiaries will be. Even though housing construction is very important, the target citizens and responsible government bodies are not known yet; some residents in Addis Ababa who need house told me that housing construction is a dire need but due to ambitious government expenditures, they suspect the plan is designed to compensate the lack of finances. They reasoned that besides the current inflation and high cost of living, they cannot pay the monthly saving amid the plan failed to consider citizens’ capabilities that lacks transparency and questioning the success of the projects. 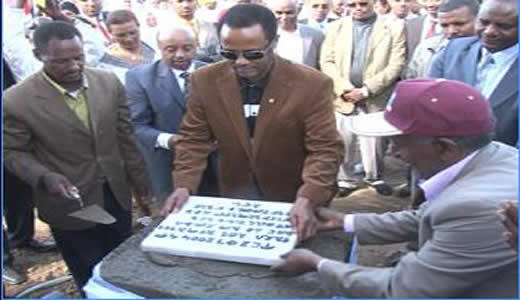 Update፡ The above “40/60 housing project” article posted on March 2013. But after 3 months the Ethiopian government city construction and development ministry, within alternatives based on the city residence income automatically changed the project into 10/90, 20/80, 40/60 and 50 % saved before registration in the form of as an association. Finally, the new housing project implemented on June 20, 2013 because of failures of earlier 40/60 project. This whole article seems to miss the point of the 40/60 housing scheme. The 40/60 scheme is only targeted for HIGH INCOME earners + the diaspora who’ll be able to afford these. Those that do not fall into this category, will be ineligible for these apartments. Just in the same way that high income earners +diaspora will be ineligible for the 10/90 & the 20/80 schemes, which is strictly for those with lower income. Most of the diaspora who would be able to afford the repayment rates, also have the option to be able to form their own ‘housing associations’ where they can pay the full 100% amount required for their apartments upfront, to ensure priority. Again, the 40/60 scheme is for diaspora + high income earners in Ethiopia only. This is done to encourage the diaspora to come back home and reinvest their hard currency back into Ethiopia. As a journalist myself, this article is terrible. It’s just completely ignored the fact that the 40/60 housing is not for everyday Ethiopia, but the select few who can afford it here in Addis or Ethiopian abroad. How will a graduate be able to afford these apartments? They can’t. Which is why they will not be eligible for this. They apply for the other housing plans, either the 10/90 or 20/80 and i think registrations for them have now closed. It’s important writers like you correct your main points before publishing articles. I’m surprised no one has corrected you on this before. You should make amendments before people just dismiss you as a writer. Which would be a shame, because as someone who doesn’t speak English as his native tongue you do write pretty well.